I Love Dooney (ILD) is Dooney and Bourke’s discount product portal. It is based on the Salesforce platform and was scheduled for a design overhaul in 2018. 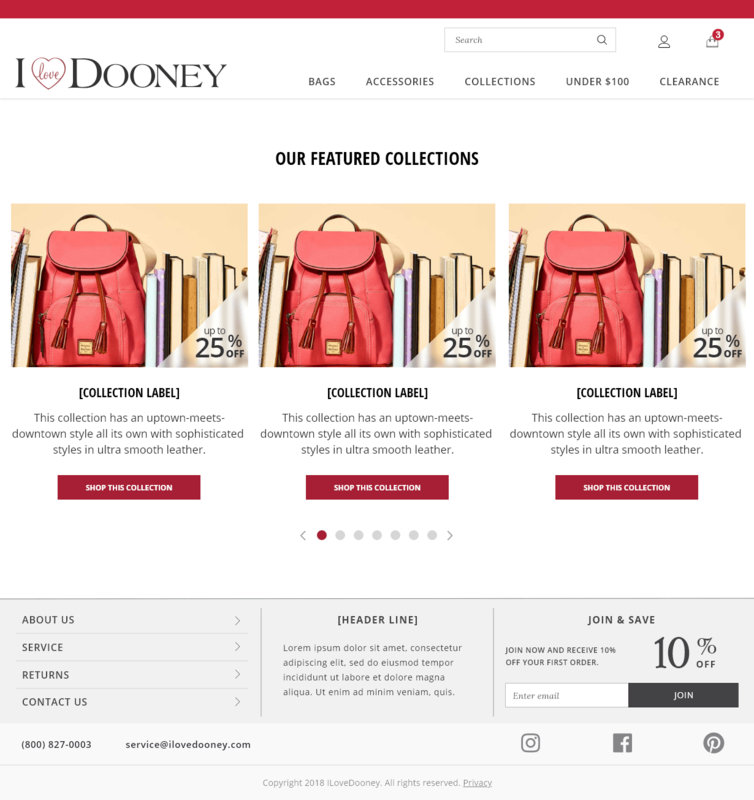 This ILD UX design project leveraged much of the discovery information I had been a part of during the 2017 Dooney.com redesign project effort. While there were some important distinctions between the two digital experiences (e.g. more fiscally aware shoppers for ILoveDooney.com) the redesign was fairly straight forward with a focus on promoting discount opportunities. Bootstrap has become a popular grid system in today’s responsive world. The original implementation of the ILoveDooney.com experience took advantage of this grid system and the SOW for the redesign effort required the reuse of the grid AS-IT-WAS. In some places the grid had been modified to accommodate various third-party plugins. There was no grid documentation (standards) available from the first ILoveDooney.com implementation so I took a stab at detailing the high-points of the grid before jumping into content and navigation redesign exercises. I used Google Chrome Inspector to scrutinize the base AS-IT-WAS grid setup. I then shared my findings with the offshore engineering team to ensure cross-functional team alignment. Exact persona attributes and investigation methods are a matter of intellectual property. However, the information below is indicative of the types of data used to make informed design decisions. Extensive User-centered design efforts had gone into the 2017 redesign of the Dooney flagship website and the client wished to leverage as much of that work effort as possible for the 2018 redesign of ILoveDooney.com. So we had to ask ourselves, what makes the ILD experience different from the flagship experience and how do we preserve those distinctions? What makes the experiences similar? The I Love Dooney user possessed a tendency to be more frugal with their disposable income; they were more savvy with their money and valued saving money more than possessing the latest trend. More importantly, they were willing to search both the Dooney.com and the ILD.com web sites before making a purchase decision. The main purpose of ILD.com was to offload legacy products at extreme discounts. Using web metrics, affinity mapping, ethnographic research and customer polling from the 2017 Dooney.com redesign effort, we were able to confirm that almost 80% of ILD shoppers were likely to visit both Dooney.com and ILoveDooney.com within the same session and before making a purchase decision. So why put common user interface controls in different places across the two digital properties? There was no quantifiable benefit to re-positioning, relabeling or otherwise altering ILD’s common UI any differently than had been implemented for Dooney.com. It doesn’t take much to see the potential for mental friction after comparing the AS-IT-WAS ILD header/footer (A) against the work done on the 2017 Dooney.com redesign project (B). The AS-IT-WAS ILD.com footer (A) is crowded, touch-targets do not follow best practices… very sloppy design execution overall. With the new ILD.com header/footer version (C), there’s still a distinct brand separation; yet also a familiarity that would silently resonate with users that are apt to visit both digital properties. ILD.com already leveraged a variety of content isotopes; many of which were scheduled to simply adopt the new accent color. Four new content isotopes were scheduled to be ported over from the 2017 Dooney.com redesign project. All four, were going to require additional content elements that helped reinforce the discount savings opportunity found exclusively on ILD.com. Would cover up too much of the product image. Better, but not quite there. Still covers up too much of the image. This is our favorite approach. Refine more and move to high fidelity.